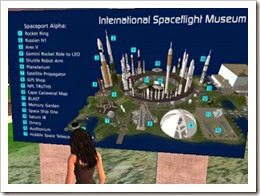 My son and I visiting the International Spaceflight Museum in Secondlife as a lesson with homeschool. 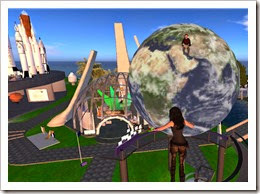 He sits on his laptop in my office, while I sit behind him, and we visit the ‘sims’ (known as areas or lands) of Secondlife. This was one of my favorite places so far in the program. There were lots of things to do, but more importantly offered some 3D, interactive ways of learning about space exploration. 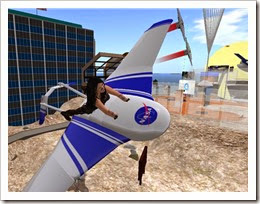 An d you get to ride on it in Secondlife. I doubt its allowed on Mars. Daniel meanwhile, continued with his habit of sitting on things. 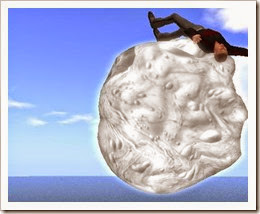 This time, he found an animated asteroid that spun him around in circles. And naturally, as his mother, I had to take a picture (screenshot) and laughed at his expense..
You can view lots of 3D models of probes, space flight vehicles, and more, and each one offered an exhibit with information on each one. 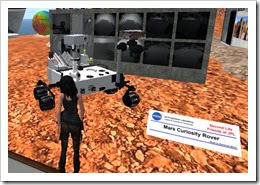 Here I’m reading about the Mars Curiosity Rover. Behind it, they include photos the Rover took when it first landed on Mars. Daniel and I stayed up until 1 am in the morning to watch the live landing, and it was so exciting and thrilling to see it landed successfully. This was part of the exhibit showing the ‘bubblewrap’ that let the Mars Pathfinder Rover, which was airbags to protect its crash. This model literally rolls down a hill to illustrate the landing. In my case, it caught me off guard and rolled over me. 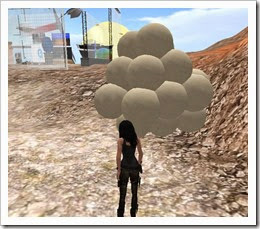 We then saw three huge, animated ‘dust devil’ fly through, illustrating the dust devils Mars has from time to time. This screenshot shows a map of Cape Canaveral. It illustrates things you can click on to tell what each spot is from a visitor center to where rockets took off. I’m showing only a fraction of what they have there. Its a ‘sim’ well the visit, more than once. In this photo, Daniel sits on the planet earth. In the background, you can see models of actual rockets. They are labeled. They include over there the Space Shuttle as well.